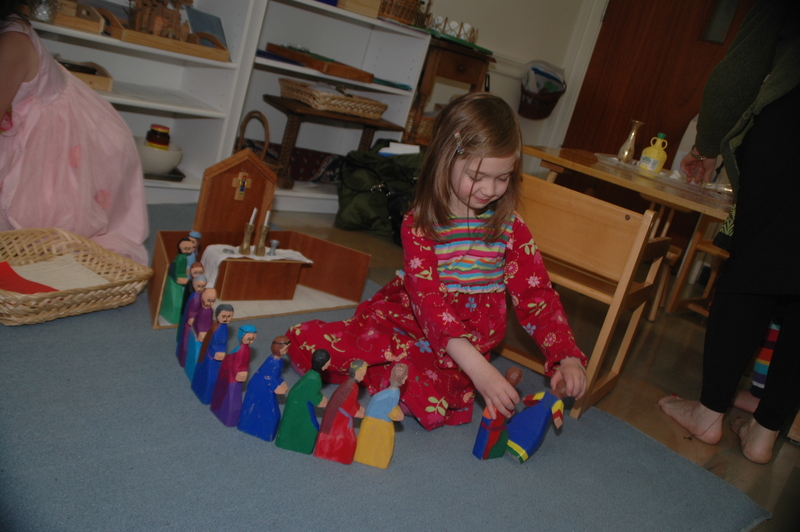 The Catechesis of the Good Shepherd is a Montessori-based approach to the religious formation of children, rooted in Sacred Scripture, Liturgy, and respect for the child’s rich relationship with God. Central to Catechesis is the atrium, a space containing hand-made materials that focus the child’s attention on key scripture passages or liturgical moments. Children in this age group are divided into three learning groups: age 3 through Kindergarten, 1st – 3rd grade, and 4th – 5th grade. Our dedicated and trained Atrium leaders are committed to helping children “fall in love with God”. This approach towards formation is one that Redeemer has cultivated over many years, and we continue to see the rewards through the deep faith that our youngest members share with us. To acknowledge that children have an innate sense of the holy, and seek to nurture their natural inquisitiveness about God and church means taking the faith of children seriously, from the pre-literate to those on the verge of adulthood. For more information on the Catechesis of the Good Shepherd, visit here.